Students from the University of Paris Dauphine conducted in Cambodia (Phnom Penh) a field experience (summer internship) for a Microfinance Institution. They had to experiment the work and missions of a loan officer in this region for two months. In the heat that filled the atmosphere of the city, the orientation is difficult to the first customers. For their appointments and negotiations with potential new entrepreneurs, students were accompanied by a loan officer, whose function is to give financial advises, to find new customers, to teach them how to properly use their credit, or to recover funds. The people rarely have internet access in these regions, so the solicitation of clients by door to door is the most direct method of prospecting and widely used by loan officers. The discussion is orally with families with the help of brochures. The informal speech is very important before talking about the loan. Students quickly understood that their studies are not a sufficient tool to face the "real life", and it is about to surpass and give the best of yourself to each door to establish the relationship of trust which may lead to the conclusion of a loan. This experience is a way for these students to see the different aspects of microcredit which reveals success stories but also some failures. For them, microcredit is an important and useful financial means in this type of area. However, they consider that it is necessary to optimize and increase the associated microcredit services such as financial counseling and mentoring or coaching especially with the families that rediscover free trade. Know more about microfinance in Cambodia. Students in the field summarize their experience in these words: "We left with the hope of becoming finance aces and we went back home humble, full of memories, grateful to our hosts who have opened our eyes to a great fascinating world, other values, with less superficiality. The human dimension has largely supplanted the technical issues." 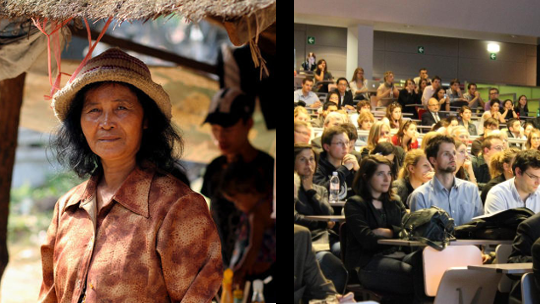 Discover the projects of microentrepreneurs in Cambodia with the microfinance institution SAMIC: see the projects.